Our favorite common name for this plant is "shindagger." We commonly contend with this plant during our travels in Carlsbad Caverns National Park. Diana once had a Lechuguilla spine in her leg for 6 months before it dissolved. 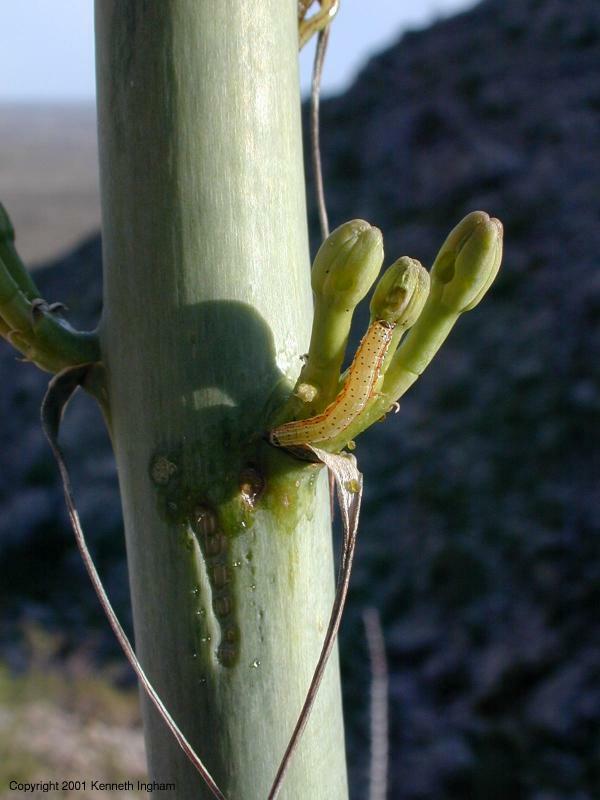 A member of the Agave family, it is an indicator species for the Chihuahuan Desert. Translated from Spanish, Lechuguilla would be "little lettuce". However, those spines are most un-lettuce-like. 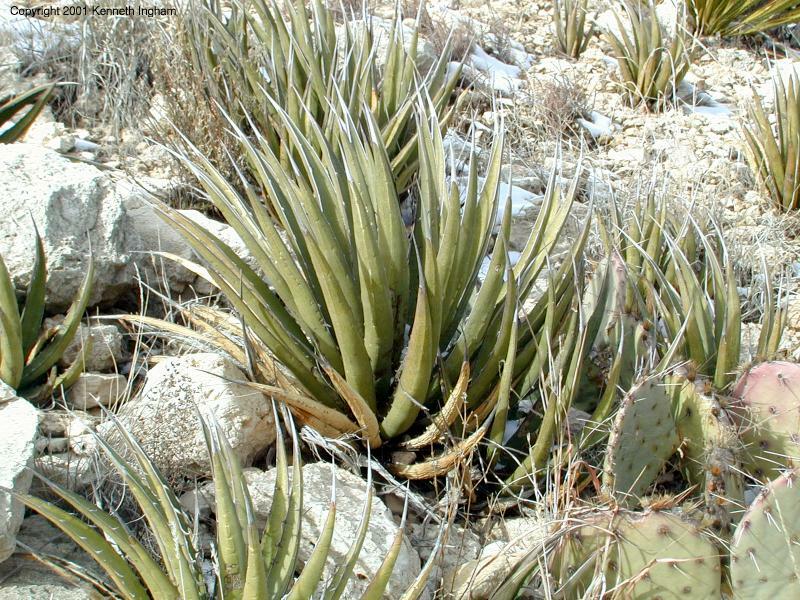 We have heard of people flattening their tires by driving over a Lechuguilla plant. This photo is from the Rattlesnake Canyon hike. The thick, curved leaves arise from the base of the plant, and end in a sharp spine. The plants often grow in large, spreading groups making it difficult to traverse an area. It blooms from April to August (or, May to June, depending on which guide you consult). A lechuguilla puts up its tall (6-16ft/2-5m) bloom stalk rapidly when it blooms. 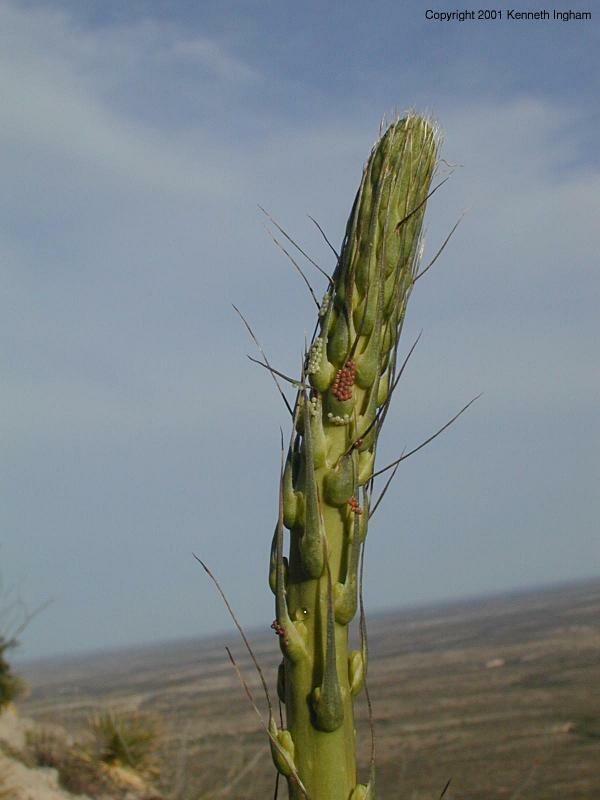 Lechuguilla bloom only once, after the plant has stored enough nutrients, which can take up to 30 years. 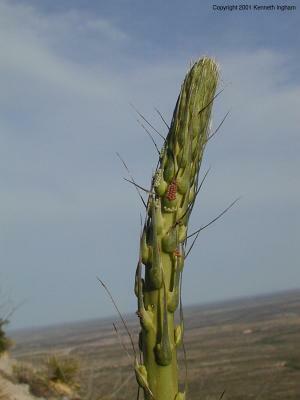 The plant normally dies after producing the bloom stalk. Habitat and range: Steve West notes that Agave lechuguilla is one of the indicator plants for the Chihuahuan Desert. Thus, it is found in south-central and southeastern New Mexico between 3500ft (1070m) and 5000ft (1520m). 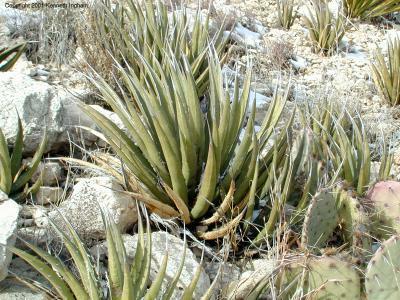 The Lechuguilla plant is still used today in Mexico for its fiber, which they make into rope. Native Americans also used the fiber for clothing and ate the roasted heart and bloom stalk. Not only humans use the bloom stalks as food; deer sometimes eat it while it is young and tender. Javelina sometimes find the new vegetative shoots tender and tasty. The root has been used for soap, because of the high concentration of saponins. One web site mentioned that the sap can be fermented to make an alcoholic beverage. The bloom stalk on a lechuguilla can reach 16ft (5m) in height. Here is a photo of one that is still growing. Some insects have decided to lay eggs here. A lechuguilla blooms only once in its life, after storing nutrients for several years. This caterpillar found the bloom stalk tasty. 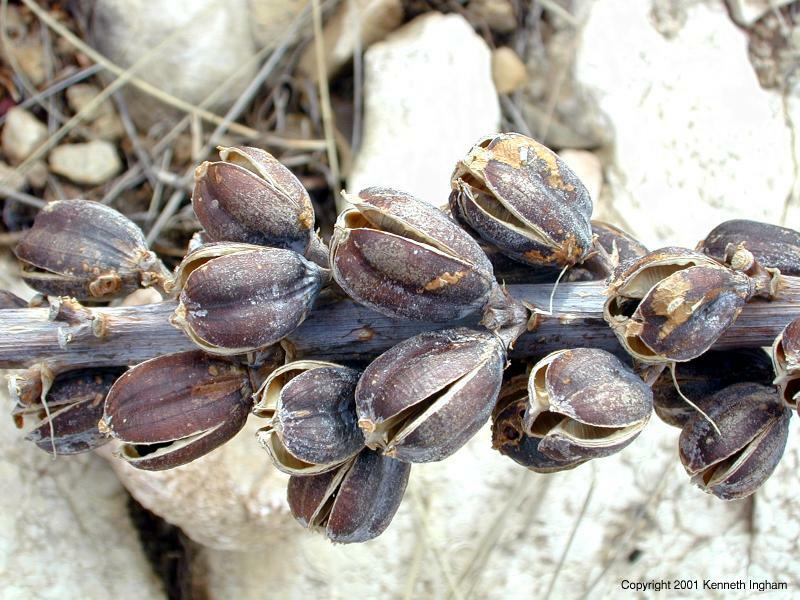 After it blooms, the seed pods look like this. West, Steve. 2000. Northern Chihuahuan Desert Wildflowers: A Field Guide to Wildflowers and Other Plants of the Desert and its Parklands. Helena, MT: Falcon Publishing, Inc.